Media | "NATO 2.0: Reboot or Delete?" Sarwar A. Kashmeri – Author, current affairs commentator, and a strategic communications advisor to international companies. senior fellow with the Atlantic Council’s International Security Program, and a fellow with the Foreign Policy Association. David Blanchflower – Bruce V. Rauner Professor of Economics at Dartmouth College. He was a member of the monetary policy committee for the bank of England from June of 2006 through May of 2009, and a contributing editor for Bloomberg TV. Moderator: Col (Prof) Cindy Jebb, Director-Social Studies Program at the U.S. Military Academy, West Point. Has the Atlantic alliance outlived its usefulness? The British journalist and writer Geoffrey Wheatcroft raised that question in an opinion article (“Who needs NATO?,” June 16) that drew a strong reaction from Ivo H. Daalder, the U.S. permanent representative to NATO, who argued that the alliance is more needed than ever (Counterpoint, June 18-19). Sarwar Kashmeri, a senior fellow in the Atlantic Council’s International Security Program and the author of “NATO 2.0: Reboot or Delete?,” joins the debate. The future of the Cold War alliance is very much up in the air as President Obama sketches out a plan for U.S. troop withdrawal from Afghanistan and Congress debates Libya. Secretary of Defense Robert Gates is blasting NATO as he goes out the door, but Ivo Daalder, the U.S. permanent representative for NATO, says the alliance is needed now more than ever. 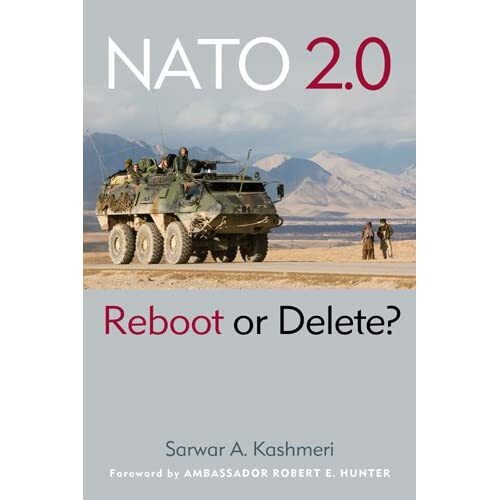 The respected Dutch newspaper, NRC Handelsblad, published an interview with Sarwar A. Kashmeri to time it with the European release of “NATO 2.0: Reboot or Delete” in Brussels. Kashmeri’s rebutal of U.S. Defense Secretary’s speech criticising the EU for not spending enough on defense found a chord with NRC and they appreciated that the book doesn’t just criticize NATO but offers a way forward to recalibrate NATO for the 21st Century. The same edition of the paper referred to this column in their lead editorial. Unfortunately, only the original Dutch versions are available. A respected American security expert and commentator is warning that NATO will fade into irrelevance if transatlantic security relations are not redesigned to let Europe handle its own security needs. “The central message of my book is that relations between the US and Europe is as important as it has been in this changing world. NATO, the transatlantic alliance, which used to act as a glue is now acting as a separator and damaging that relationship. It needs to be recalibrated, so it doesn’t do more damage,” Sarwar Kashmeri told the Kuwait News Agency, KUNA, in an interview. Kashmeri is a senior fellow in the international security programme with the Washington-based Atlantic Council, and a fellow with the New York based Foreign Policy Association. He was in Brussels Wednesday to launch his new book “NATO 2.0: Reboot or Delete” at an event organised by the Brussels-based think tank “International Security Information Service (ISIS)”. Kashmeri who opriginally hails from Mumbai, India , is also a senior advisor at ISIS. NATO scholar Sarwar Kashmeri said Gates might be overly optimistic about the power of his words. A senior fellow at the Atlantic Council, Kashmeri recently published a book called “NATO 2.0: Reboot or Delete.” He doesn’t think Gates’ remarks will have the resonance the secretary hopes — or that they should. Sarwar Kashmeri discusses NATO’s performance in Libya and his new book “NATO 2.0: Reboot or Delete” with FOX News anchor Jamie Colby…..
International relations have always been complicated, and never so much as in the years since September 11th. Sarwar Kashmeri of Reading is a senior fellow of the Atlantic Council’s International Security Program. He’s also a VPR commentator. He says that last night’s news of bin Laden’s death brought unusual clarity to foreign affairs, at least for a brief moment. As the U.S. officially turns over control of Libya operations to NATO, FPA Fellow Sarwar Kashmeri, the author of a new book on NATO, says it’s the wrong move. Sarwar Kashmeri, author of NATO 2.0: Delete or Reboot, discusses Afghanistan, Pakistan, and the NATO Summit on the radio show, “For Your Ears Only,” with host, Brian Alpert. Sarwar kasmeri, author of NATO 2.0: Delete or Reboot, discussing the bleak future of NATO if they do not align with the European Union. AFTER centuries of squabbles and diplomatic wrangles, closer military relations with France will be met with reluctance on both sides of the English Channel. Yet defence analysts insist the uneasy be-fellows would prosper from the relationship – despite the countries’ recent difficulties over Nato and Iraq. Sarwar Kashmeri, a senior fellow at the International Security Programme of the Atlantic Council, said the agreement indicated that the UK and France had overcome their difficulties. When Charles de Gaulle resigned as the president of France in 1969, relations improved, paving the way for the UK to join the common market in 1973. But while British policy has favoured an expansion of the EU, France has advocated protectionism and restricting membership. He said: “There will be understandable caution, but I think this will be a very positive change for the way European countries work together. The UK’s decision to recalibrate its defence relationship with France and the European Union is good news. Difficulties with France in recent years can be traced back to the Suez Crisis in 1956, Mr Kashmeri added. British-French relations soured as the US and the UK grew ever closer on the international scene. Britain was then initially snubbed by France over its entrance to the European Economic Community and later the European Union. After decades of relative calm, the war in Iraq in 2003 reopened old wounds, with France famously opposed to such action. French president Nicolas Sarkozy hailed a new era, however, embracing the chance to establish a closer relationship with Britain than existed under Jacques Chirac and Francois Mitterrand. After centuries of squabbles and diplomatic wrangles, closer military relations between Britain and France may be met with reluctance on both sides of the English Channel. Yet defence analysts insist the traditionally uneasy bedfellows could prosper from the relationship – despite recent difficulties over Nato and Iraq. Sarwar Kashmeri, a senior fellow at the International Security Program of the Atlantic Council, said recent developments suggest the two nations may have overcome their difficulties. “There will be understandable caution but I think this will be a very positive change for the way European countries work together. “If this collaboration ends the turf wars that occupy the EU-Nato relationship, it will be a real step in the right direction. The conflict in Afghanistan has seen billions of dollars spent and tens of thousands of soldiers deployed by the US in its effort to oust the Taliban and foil the insurgency. But eight years after the initial invasion, the war has failed to break the backbone of the militants in a country that suffers from a power vacuum at its centre. It has also become increasingly unpopular back home as army families count the cost of growing casualties. It is against this background that President Barack Obama made what many are claiming to be one of his most important announcements in his less than year-old administration. In it, the US head of state confirmed his second troop surge since coming to power. By next summer 30,000 additional soldiers will be deployed to the region in a bid to turn around flagging efforts to subdue the insurgency. It will take the total number of American fighters in the region close to the 100,000 mark. As of October, there were around 68,000 US troops in the country. It shows a marked acceleration in soldiers deployed in the country since 2001. In the first two years of conflict the commitment from Washington hovered under the 10,000 mark. By the end of 2005 a further 10,000 servicemen and women had been sent over to fight. But it is the months since November 2008 that has seen the greatest growth in US army numbers in the region. In that time the number of US soldiers in Afghanistan has doubled to its current total. Troop level trends are mirrored by casualty figures – the greater the presence the higher the body count. In the first full year of conflict, the US army lost 49 soldiers. To date, 2009 has seen almost 300 US fighters killed, almost half of them as a result of roadside bombs. In this light, the decision by President Obama to send tens of thousands additional soldiers to the region could be seen as political risky. Polls have seen the popularity of the conflict drop as the years have progressed. A recent CNN survey found that only 39% of Americans favour the war, with 58% opposed to it. But the nation seems evenly split over whether a surge of troops would now be a good thing. The delay in announcing the decision over numbers – there was a three month hiatus during which Mr Obama chewed over General Stanley McChrystal’s report on progress in the country – reflected in part the political sensitivity of the issue. The president was keen to be seen not to be rushing a decision that could result in an increase in US casualties. But only part of today’s announcement focused on numbers. Of more importance, many believe, was Mr Obama’s statements on strategy and a potential end game. In a move less anticipated than the troop surge, Mr Obama announced that a US military withdrawal would commence in July 2011. US foreign policy expert Sarwar Kashmeri said the move could be taken as an indication that the president believes that if military objectives are not achieved by then with additional troops, they will never be achieved. The speech was light on direct demands on President Hamid Karzai – the Afghanistan leader often criticised for allowing corruption to dominate the political landscape – to up his game. Washington has long demanded a strong, stable partner to work with in Afghanistan. The recent election debacle did little to improve confidence in Mr Karzai’s regime. The announcement of an increased US military presence, coupled with a new strategy focused more on training a home grown security force will give further credence to those who have long argued that the previous US administration got Afghanistan fundamentally wrong from the start. Anthony Cordesman, former director of intelligence assessment at the Office of the Secretary of Defence, is one of those who believes that the current situation would be far better if a different approach had been employed in the early stages of the conflict. Now a military strategy expert at the Washington-based Centre for Strategic & International Studies, Professor Cordesman said: “Frankly we under-resourced the war and we lost it. Professor Cordesman believes that too much importance has been placed on the overall level of soldiers deployed. “Certainly it is not a matter of troop levels, it is a matter of changing the strategy and resourcing it,” he said. The failings of the past aside, the US still has an opportunity to turn around a situation that some suggest increasingly resembles a quagmire. Professor Cordesman noted that the Taliban continued to be a weak and largely unpopular force. “We still have the ability to turn it around,” he said.